The mail artist community values the interconnectedness of the participants and promotes an egalitarian ethos that frequently circumvents official art distribution and approval systems such as the art market, museums, and galleries. Mail artists rely on their network as the primary way of sharing their work, rather than being dependent on the ability to locate and secure exhibition space. The community embraces this outsider or alternative status, and refers to itself as "The Eternal Network" or just "The Network." At its core, mail art is about interpersonal communication, exchange and the creation of a virtual community of participants. In this way, mail art can be seen as anticipating the cyber communities founded on the Internet. Artist Edward M. Plunkett has argued that communication-as-art-form is an ancient tradition; he posits (tongue in cheek) that mail art began when Cleopatra had herself delivered to Julius Caesar in a rolled-up carpet. While some might consider early avant-garde experiments with the postal system to be the origin of the movement, the term "mail art" was not coined until the 1960s. 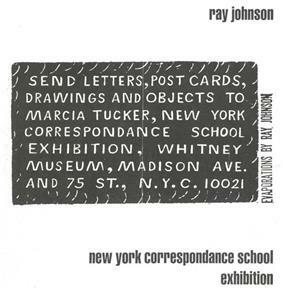 "The Futurists already had taken an interest in mail art, but the official birth of the phenomenon dates to the early 1960s when Ray Johnson's New York Correspondance [sic] School, institutionalized the free exchange of postal messages between artist and artist or between artist and audience." Ray Johnson's experiments with posting instructions and soliciting activity from his recipients began in the late 1950s, and provided mail art with a blueprint for the free exchange of art via post. In 1962, Plunkett coined the term "New York Correspondence School" to refer to Johnson's activities; Johnson adopted this moniker but intentionally misspelled it as "correspondance." The deliberate misspelling was characteristic of the playful spirit of the Correspondance School and its actions. Most of the Correspondance School members are fairly obscure, and the letters they sent, often featuring simple drawings or stickers, often instructed the recipient to perform some fairly simple action. Johnson's work consists primarily of letters, often with the addition of doodles and rubber stamped messages, which he mailed to friends and acquaintances. The Correspondance School was simply a network of individuals who were artists by virtue of their willingness to play along and appreciate Johnson's sense of humor. One example of the activities of the Correspondance School consisted in calling meetings of fan clubs, such as one devoted to the actress Anna May Wong. Many of Johnson's missives to his network featured a hand drawn version of his personal logo, a bunny head. In a 1968 interview, Johnson explained that he found mailed correspondence interesting because of the limits it puts on the usual back and forth interaction and negotiation that comprises communication between individuals. Correspondence is "a way to convey a message or a kind of idea to someone which is not verbal; it is not a confrontation of two people. It's an object which is opened in privacy, probably, and the message is looked at ... You look at the object and, depending on your degree of interest, it very directly gets across to you what is there ..."
On April 5, 1973, Johnson declared the "death" of the New York Correspondance School in an unpublished letter to the Obituary Department of The New York Times and in copies that he circulated to his network. However, he continued to practice mail art even after this. Although much of Johnson's work was initially given away, this hasn't prevented it from attaining a market value. Andy Warhol is quoted as saying he would pay ten dollars for anything by Johnson." In his 1973 diagram showing the development and scope of Robert Filliou. 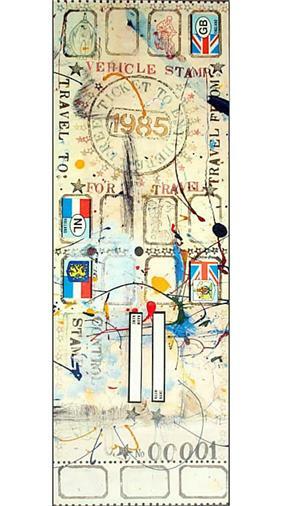 Filliou coined the term the "Eternal Network" that has become synonymous with mail art. Other Fluxus artists have been involved since the early 1960s in the creation of artist's postage stamps (Robert Watts, Stamp Dispenser, 1963), postcards (Ben Vautier, The Postman's Choice, 1965: a postcard with a different address on each side) and other works connected to the postal medium. 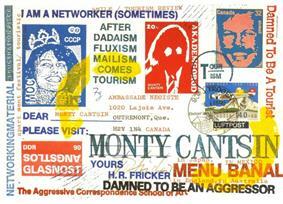 "Indeed, the mail art network counts many Fluxus members among its earliest participants. While Johnson did not consider himself directly as a member of the Fluxus school, his interests and attitudes were consistent with those of a number of Fluxus artists. ^ a b c d "Mail Art". Collection: MOCA's First Thirty Years. MOCA: The Museum of Contemporary Art, Los Angeles. Retrieved 11 April 2013. ^ a b c Phillpot, Clive (1995). Chuck Welch, ed. Eternal Network: A Mail Art Anthology. Canada: University of Calgary Press. Retrieved 11 April 2013. ^ a b c d "Mail Art". Digital Collections, UB Libraries. University at Buffalo, The State University of New York. Retrieved 11 April 2013. ^ a b "Mail Art @ Oberlin". Oberlin College Art Library. Oberlin College & Conservatory. Retrieved 11 April 2013. ^ Richard Kostelanetz; H. R. Brittain (2001). A Dictionary of the Avant-gardes. Routledge. p. 388. ^ a b c """About John Held Jr. in the Spark episode "The Fine Art of Collecting. Spark. KQED. 2004. Retrieved 11 April 2013. ^ a b c Plunkett, Edward M. (1977). "The New York Correspondence School". Art Journal (Spring). Retrieved 11 April 2013. ^ a b c Danto, Arthur C. (March 29, 1999). "Correspondance School Art". The Nation. Retrieved 11 April 2013. ^ a b "Oral history interview with Ray Johnson, 1968 Apr. 17". Archives of American Art. Smithsonian Institution. Retrieved 11 April 2013. ^ "Ray Johnson mail art to Lucy R. Lippard, 1965 June 29". Archives of American Art. Smithsonian Institution. Retrieved 11 April 2013. ^ "Ray Johnson Biography". Ray Johnson Estate. Retrieved 11 April 2013. ^ Bloch, Mark. "An Authentik and Historikal Discourse On the Phenomenon of David Zack, Mail Artist". In Istvan Kantor. Amazing Letters: The Life and Art of David Zack. Retrieved 11 April 2013. ^ Jacob, John (1985). "East/West: Mail Art & Censorship". PostHype 4 (1). ^ Lloyd, Ginny (1981). "The Mail Art Community in Europe". Umbrella Magazine 5 (1). ^ Ross, Janice (August 26, 1984). "A gleefully rebellious festival of dada". Oakland Tribune (Art: The Tribune Calendar). Retrieved 11 April 2013. ^ a b "Hans-Reudi Fricker". Mail Art @ Oberlin. Oberlin College & Conservatory. Retrieved 11 April 2013. 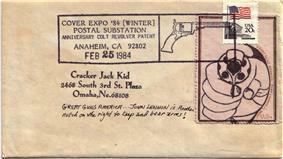 ^ "Mail Art From 1984 Franklin Furnace Exhibition". Franklin Furnace. Retrieved 25 January 2014. ^ Pittore, Carlo. "An Open Letter to Dr. Ronny Cohen (part 1)". panmodern.com. Retrieved 25 January 2014. ^ Pittore, Carlo. "An Open Letter to Dr. Ronny Cohen (part 2)". panmodern.com. Retrieved 25 January 2014. ^ Azon, Gary (March 13, 1984). 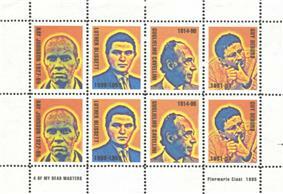 "Mailart Melee". Village Voice. Retrieved 25 January 2014. ^ Mark, Bloch. "Franklin Furnace Fracas". Retrieved 25 January 2014. ^ Jacob, John (1984). "Mailart: A Partial Anatomy". PostHype 3 (1). ^ Mark, Bloch. "Ray Johnson's letter to me after the event, questioning the issue of sexism.". panmodern.com. Retrieved 25 January 2014. ^ Jacob, John (1987). The Coffee Table Book of Mail Art: The Intimate Letters of J.P. Jacob, 1981 - 1987. New York: Riding Beggar Press. ^ Guy Bleus (Ed. ), Re: The E-Mail-Art & Internet-Art Manifesto, in: E-Pêle-Mêle: Electronic Mail-Art Netzine, Vol.III, n° 1, T.A.C.-42.292, Hasselt, 1997. ^ a b c d e Welch, C. (1995). Eternal network: A mail art anthology. Calgary, Alta: Univ. of Calgary Press. ^ C. Carr (9 April 2012). On Edge: Performance at the End of the Twentieth Century. Wesleyan University Press. pp. 105–. ^ a b Elving, Bell (April 30, 1998). "Pushing The Envelope". The Washington Post. ^ Christoph Cox; Daniel Warner (1 September 2004). Audio Culture: Readings in Modern Music. Continuum. pp. 60–. ^ "The Techniques". Mail-Art:The Forum. Retrieved 23 October 2013. ^ Friedman, Ken (1984). Wilson, Martha, ed. "Mail art history: the Fluxus factor". FLUE - Special Issue: Mail Art (Franklin Furnace) 4 (3–4). Mailable fake fur ("Hairmail") and Astroturf postcards were marketed in the late 1990s. Printed matter and ephemera are often circulated among mail artists, and after artistic treatment, these common items enter into the mail art network. Small assemblages, sculptural forms or found objects of irregular shapes and sizes are parceled up or sent unwrapped to deliberately tease and test the efficiency of the postal service. In addition to appropriating the postage stamp model, mail artists have assimilated other design formats for unique and printed artworks. Artists' books, decobooks and friendship books, banknotes, stickers, tickets, artist trading cards (ATCs), badges, food packaging, diagrams and maps have all been explored. Lettering, whether handwritten or printed, is integral to mail art. The written word is used as a literary art form, as well as for personal letters and notes sent with artwork and recordings of the spoken word, both of poetry and prose, are also a part of the network. Although English has been the de facto language, owing to the movement's inception in America, an increasing number of mail artists, and mail artist groups on the Internet, now communicate in Breton, French, Italian, German, Spanish, and Russian. Printing is suited to mail artists who distribute their work widely. 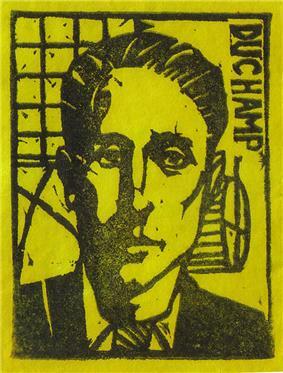 Various printmaking techniques, in addition to rubber stamping, are used to create multiples. Copy art (xerography, photocopy) is a common practice, with both mono and color copying being extensively used within the network. Ubiquitous 'add & pass' sheets that are designed to be circulated through the network with each artist adding and copying, chain-letter fashion, have also received some unfavorable criticism. 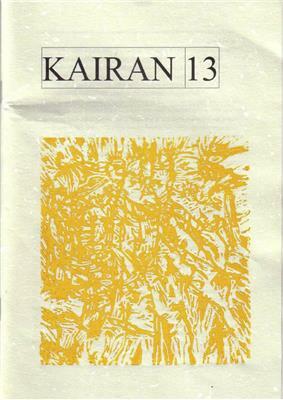 However, Xerography has been a key technology in the creation of many short-run periodicals and zines about mail art, and for the printed documentation that has been the traditional project culmination sent to participants. Inkjet and laserprint computer printouts are also used, both to disseminate artwork and for reproducing zines and documentation, and PDF copies of paperless periodicals and unprinted documentation are circulated by email. Photography is widely used as an art form, to provide images for artistamps and rubber stamps, and within printed and digital magazines and documentation, while some projects have focused on the intersection of mail art with the medium itself. Mail art has also appropriated the postage stamp as a format for individual expression. Inspired by the example of Cinderella stamps and Fluxus faux-stamps, the artistamp has spawned a vibrant sub-network of artists dedicated to creating and exchanging their own stamps and stamp sheets. Artistamps and rubber stamps, have become important staples of mail artworks, particularly in the enhancement of postcards and envelopes. Mail art has adopted and appropriated several of graphic forms already associated with the postal system. The rubber stamp officially used for franking mail, already utilized by Dada and Fluxus artists, has been embraced by mail artists who, in addition to reusing ready-made rubber stamps, have them professionally made to their own designs. They also carve into erasers with linocut tools to create handmade ones. These unofficial rubber stamps, whether disseminating mail artists' messages or simply announcing the identity of the sender, help to transform regular postcards into artworks and make envelopes an important part of the mail art experience. Because the democratic ethos of mail art is one of inclusion, both in terms of participants ('anyone who can afford the postage') and in the scope of art forms, a broad range of media are employed in creation of mail artworks. Certain materials and techniques are commonly used and frequently favored by mail artists due to their availability, convenience, and ability to produce copies. Ray Johnson suggested (with a pun) that "mail art has no history, only a present", and mail artists have followed his playful attitude in creating their own mythologies. 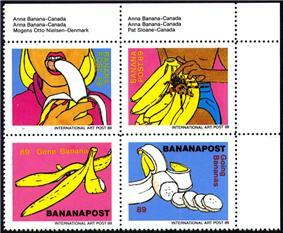 Parody art movements like artistamps are issued. Furthermore, attempts have been made to document and define the history of a complex and underestimated phenomenon that has spanned five decades. Various essays, graduate theses, guides and anthologies of mail art writings have appeared in print and on the Internet, often written by veteran networkers. A mail artist may have hundreds of correspondents from many different countries, or build a smaller core circle of favorite contacts. Mail art is widely practiced in Europe, North and South America, Russia, Australia and Japan, with smaller numbers of participants also in Africa, and China. In addition to being kept by the recipient, mail art archives have attracted the interest of libraries, archives, museums, and private collectors. Or, the works may be 'worked into' and recycled back to the sender or to another networker. Mail art has been exhibited in alternative spaces such as private apartments, municipal buildings, and shop windows, as well as in galleries and museums worldwide. Mail art shows, periodicals, and projects represent the "public" side of postal networking, a practice that has at its core the direct and private interaction between the individual participants. Mail artists value the process of exchanging ideas and the sense of belonging to a global community that is able to maintain a peaceful collaboration beyond differences of language, religion and ideology; this is one aspect that differentiates the mail art network from the world of commercial picture postcards and of simply "mailed art." The mail art philosophy of openness and inclusion is exemplified by the "rules" included in invitations (calls) to postal projects: a mail art show has no jury, no entry fee, there is no censorship, and all works are exhibited. The original contributions are not to be returned and remain the property of the organizers, but a catalogue or documentation is sent free to all the participants in exchange for their works. Although these rules are sometimes stretched, they have generally held up for four decades, with only minor dissimilarities and adjustments, like the occasional requests to avoid works of explicit sexual nature, calls for projects with specific participants, or the recent trend to display digital documentation on blogs and websites instead of personally sending printed paper to contributors. 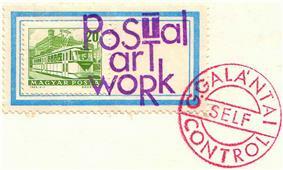 In spite of the many links and similarities between historical avant-garde, alternative art practices (visual poetry, copy art, artist's books) and mail art, one aspect that distinguishes the creative postal network from other artistic movements, schools or groups (including Fluxus) is the way it disregards and circumvents for the commercial art market. Any person with access to a mailbox can participate in the postal network and exchange free artworks, and each mail artist is free to decide how and when to answer (or not answer) a piece of incoming mail. Participants are invited by network members to take part in collective projects or unjuried exhibitions in which entries are not selected or judged. While contributions may be solicited around a particular theme, work to a required size, or sent in by a deadline, mail art generally operates within a spirit of "anything goes." By the 1990s, mail art's peak in terms of global postal activities had been reached, and mail artists, aware of increasing postal rates, were beginning the gradual migration of collective art projects towards the web and new, cheaper forms of digital communication. The Internet facilitated faster dissemination of mail art calls (invitations) and precipitated the involvement of a large number of newcomers. Mail art blogs and websites became ever more frequently used to display contributions and online documentation, even if many mail artists still preferred the surprise of a catalogue found in their mailbox. The rise of mail art meetings and congresses during the late '80s, and the articulation of various "isms" proclaimed by their founders as movements within mail art, were in part a response to fractures made visible by the events surrounding the Franklin Furnace exhibition. Even if "tourism" was proposed satirically as a new movement by H.R. Fricker, a Swiss mail artist who was one of the organizers of the 1986 Mail Art Congress, nevertheless mail art in its pure form would continue to function without the personal meeting between so-called networkers. As mail artist Anna Banana put it, "the best part about mail art is that you don't have to be there in person to be in on the action."